Welcome to another week of Garage sale finds Friday, where today happens to be lucky number 13! 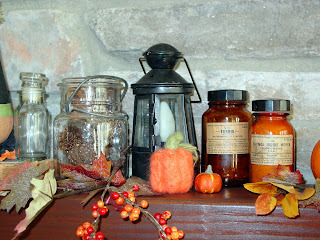 I thought I would share with you some of my fall decorations that I have picked up at garage sales. And show you that decorating for a holiday doesn't have to break the bank! 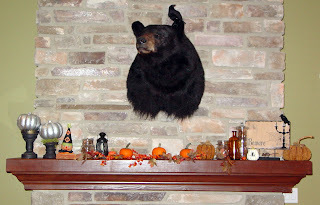 Here's the mantle in my living room all decked out. Most of the items on it, came from garage sales. Let's look from left to right. 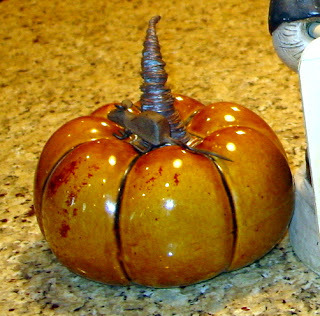 See the candlesticks that the pumpkins are sitting on? Garage sale. The mason jar? Garage sale. The lantern? Garage sale. The fall leaves? Garage sale. The three pumpkins in the middle are real, from a local fruit stand, but the faux ones next to them? Garage Sale. 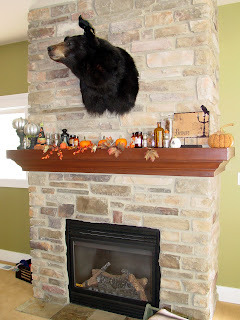 I actually wrote this blog post before I found a few other things to add to the mantle. It's like those pictures you see in the magazines "can you spot the differences?" I added a few things. See the cool jars on the far right? 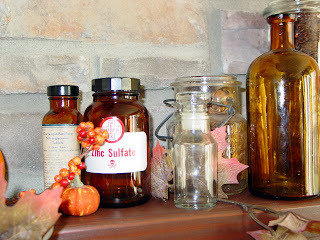 Those are old pharmacy jars. I couldn't pass them up when I saw them. The guy wanted $5 a piece, but I ended up finally talking him down to $12 for 5 jars. 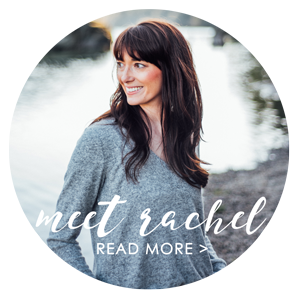 They have such cool labels on them and are so authentic! On the far left of this picture there are a few more bottles. Love them! Here's a close up of a few more jars that I picked up recently. 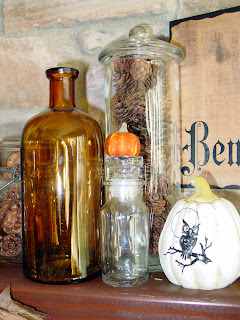 The small jar was 25 cents, the brown jar and the apothocery jar were both $1 each. The Beware sign was something I made last year. This ceramic pumpkin still had it's $30 price tag on it from a local boutique. I paid $2. I got this mirrored tray at a garage sale for $1, added the old books (I never pay more than 50 cents a piece for them), and the little apothecary jar was $1 at a garage sale. 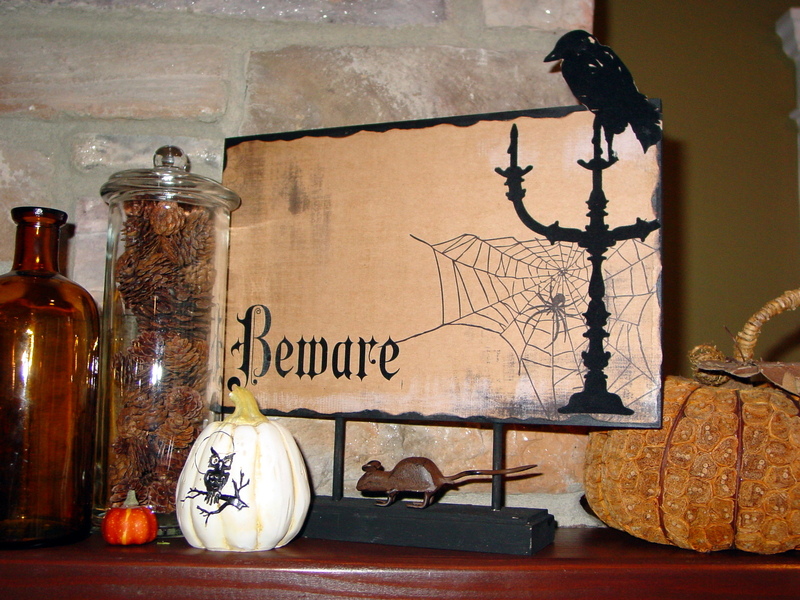 The crow is from the dollar store last year. 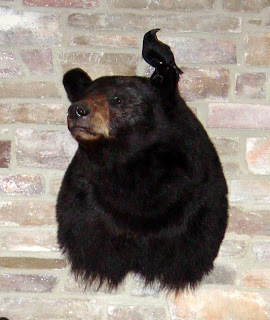 Even Rocky, our bear, got a little decoration. The copper pumpkins are all from a garage sale and the Subway sign was downloaded last year from some super awesome blog. I just don't remember which one. 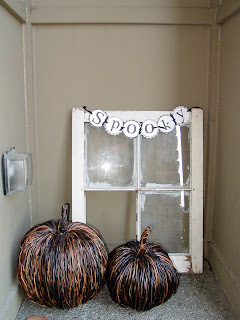 I picked up these big wicker pumpkins for $5 for both. 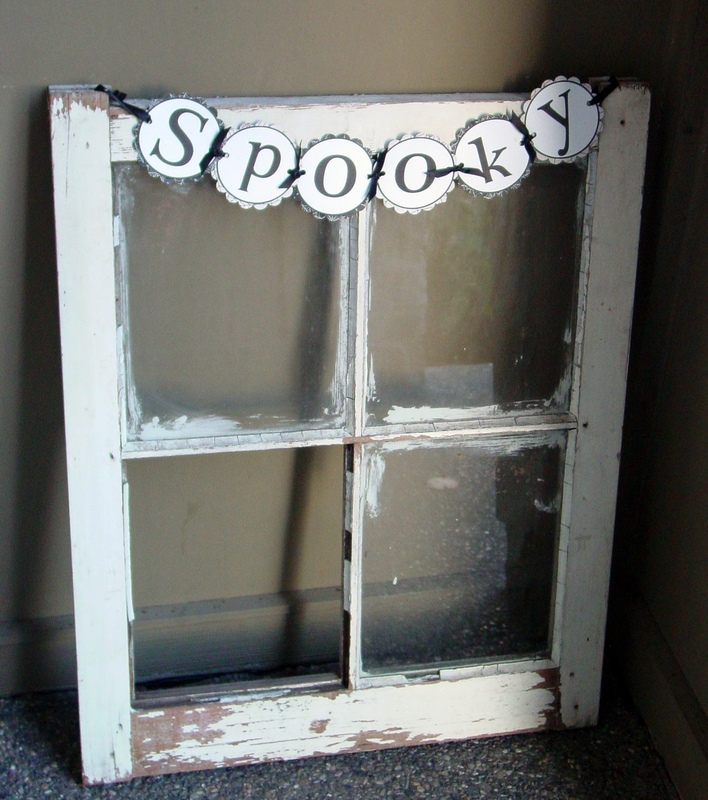 This window sits on our front porch and now has a "spooky" sign that I won last year from Christina. And this leaf wreath is one of my favorites! I got it several years ago for $4 and love it! I love it more now because it matches the outside of our new house even better than our old one. 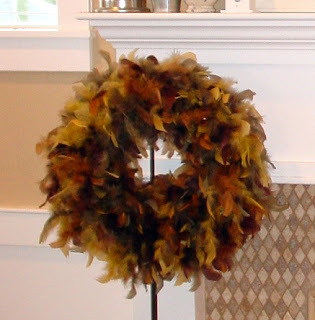 And speaking of wreaths, this feather wreath is inside in my den on a wreath stand that I got at, where else, a garage sale. 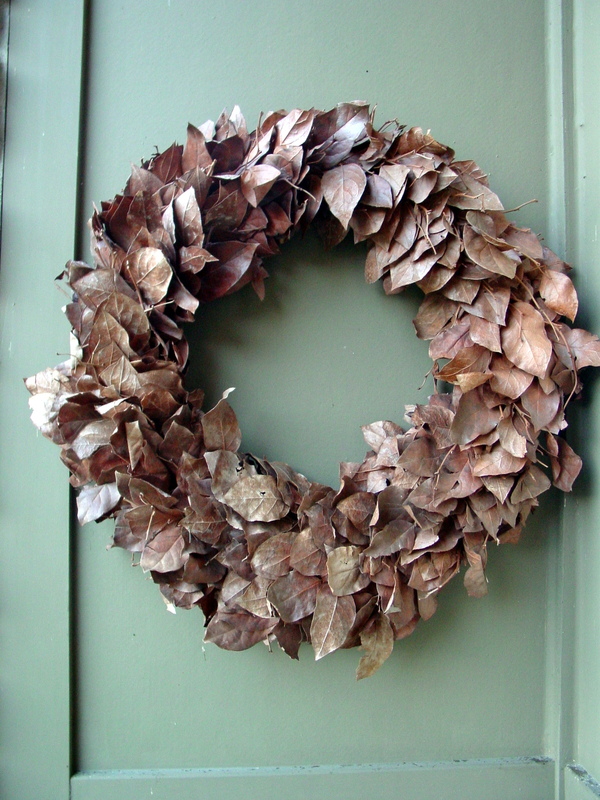 The wreath was $2 at a garage sale. So while I love to window shop and dream about buying things like this and this, I'm happy to buy most of my decorations for nearly next to nothing! Very nice, and I'm glad you got him to come down on the price of the jars! Esp this late in the garage sale season- he'd better be generous! 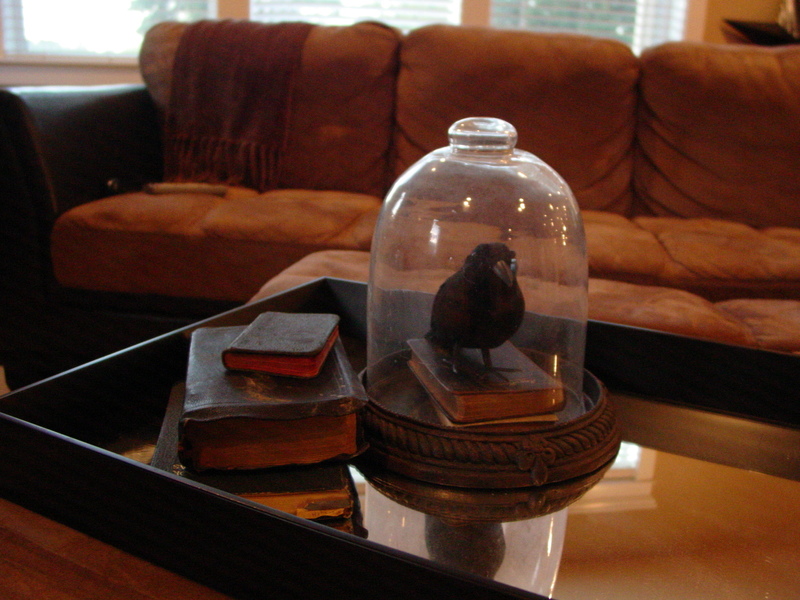 You've given his lovely things a nice HOME! More great finds! 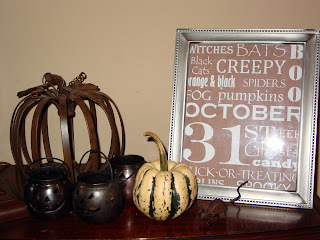 Love the ceramic and wicker pumpkins. 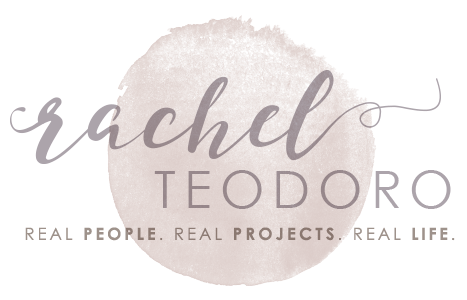 Thank you for linking up over at Cap Creations again!